(Starlord#2 (fb) - BTS) - General Viz Glazgon led (and possibly formed?) the Iforani mercenary group. They were based on the planet Holmrig. (Starlord#3 (fb) - BTS) - The presence of the Iforani and perhaps other reasons also made Holmrig one of the safest places to enjoy the nightlife, as few wished to make trouble in the Iforani's home ground. (Starlord#2 (fb) - BTS) - Harith Damyish, a Lawgiver on the planet Bovric and secretly one of the telepathic Probiti, obtained information and/or materials on Glazgon that allowed Damyish to blackmail Glazgon. (Starlord#3 (fb) - BTS) <1 month prior to the main story> - The Iforani headquarters building was inspected. (Starlord#1 - BTS) - Monitoring Damyish, Starlord (Sinjin Quarrel) and his partner, the sentient starship Rora, learned that he planned to blackmail Viz Glazgon to take care of Starlord (and to make plans to blackmail others as back up). (Starlord#2 - BTS) - Seeking to prevent the secretly telepathic Harith Damyish from uniting with Glazgon and the Iforani in an assault on Carina Prime (in order to take over the entire Carinian Cluster), Starlord and Rora repared to travel to Holmrig and meet with Glazgon. The journey would take a couple days. (Starlord#3 (fb) - BTS) <Either prior to or during Starlord's journey to Holmrig> - Damyish promised Glazgon to give him the information he had used to blackmail Glazgon in return for Glazgon capturing Starlord and his ship. (Starlord#3 (fb) - BTS) - Damyish -- who thought Sinjin was Starlord's partner and the ship's pilot -- had his enforcer Colonel Castonis (or other agents, possibly the Iforani) kidnap Sinindru and Merimarth Quarrel and bring them to Holmrig to use as leverage in case Starlord opposed him. (Starlord#3 - BTS) - Damyish's ship landed on Holmrig, and he and Castonis, with the Quarrels, rendezvoused with Glazgon at Iforani headquarters. (Starlord#3 - BTS) - Rora and Starlord arrived on Holmrig, hoping that had beaten Damyish there and that they could find a way to persuade Glazgon not to help Damyish with his planned coup. 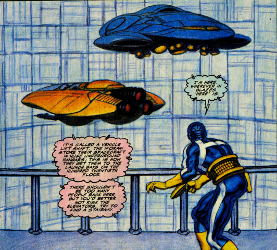 (Starlord#3 - BTS) - As Sinjin entered the Iforani Corporate headquarters, Rora sent one of her widgets to transport Starlord's element gun to him within the building, so he could get through security screening without his weapon. She further noted that Damyish had landed about an hour before them, and she reasoned Damyish must have stopped somewhere along the way. (Starlord#3) - Sinjin made his way past a mechanic, from whom he learned the touchcode for the portals to the private sections. (Starlord#3 - BTS) - After passing through the portal, Sinjin received his element gun via a widget, after which Rora opened a service duct portal, through which Sinjin passsed quickly before Rora or the widget could be spotted by security systems. As he passed through the duct, Sinjin changed into his Starlord costume. (Starlord#3 (fb) - BTS) - Damyish and Starlord sealed a contract for the capture of Starlord and his ship in exchange for the material with which Damyish could blackmail Glazgon. 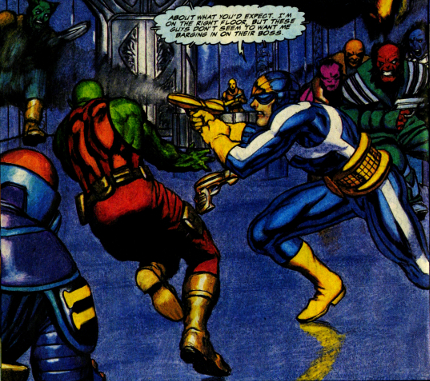 (Starlord#3) - As Starlord, Quarrel soon arrived at the Vehicle Lift Shaft. After Rora explained what it was, he leapt into the middle of the shaft and used it to travel up to the 110th floor rather than try to sneak up 110 flights of stairs undetected. As he approached his destination, he was spotted and fired upon by some of the Iforani. Using air bursts to push himself out of the shaft and onto the walkway, and he then used fire to melt a side panel to exit the room altogether. He arrived in a chamber just outside Glazgon's office, where a number of Iforani were stationed. Though they tried to stop him, he used his Element Gun to fight them off until he could reach Glazgon's office. 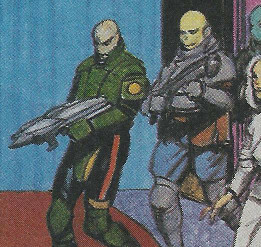 After Starlord entered the room, Glazgon -- flanked by Major Eil'gi and at least 6 other Iforani, each with a weapon trained on Starlord -- instructed Starlord to holster his weapon. Starlord complied, noting he only wished to talk, but when Glazgon thanked him for peacefully surrendering, Starlord clarified he was not surrendering, as his partner was about to create some serious trouble for him. 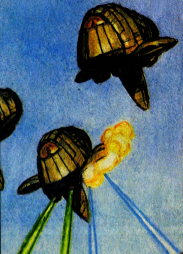 At that point Rora began shooting some of the Iforani's Verteor 250 ships. However, as the next batch came up from below, Rora was forced to station herself above them to block their passage and "stare them down," leaving her unable to help Starlord. After Glazgon congratulated Starlord's partner's combat skills, Sinjin tried to bluff Glazgon, noting how Rora was in position to destroy his heavy-duty Gravifex beams, trapping the fighters underground and leaving him vulnerable. However, Damyish then revealed he held Sinjin's parents hostage, which effectively prevented Rora from taking any action at the risk of the Quarrels' lives. Seeking to try to lesson the odds against him, Starlord offered to reveal Damyish's secret, and Glazgon ordered Major Eil'gi and the rest of his solders to stand down and wait outside for further orders. When Starlord reminded Damyish that the information was going to go out to everyone present, Damyish told Glazgon to send out the men in the hidden gunports, and Glazgon complied. Glazgon complimented Damyish on his resources, as he didn't think anyone outside of the Iforani upper echelon knew about his hidden gunports, but Starlord then revealed that Damyish was a telepath. After Damyish explained how he had a contract to which Glazgon was honor bound, Sinjin had Rora -- who had located Damyish's pod containing the blackmail material amongst the city's tractor-beam guided secure message pods -- send Damyish's material flying through a window and, as expected, Castonis' hair-trigger reflexes caused him to blast it out of the air, destroying it. Though appreciating this, Glazgon was inclined to follow the contract and subdue Starlord, until Starlord correctly reasoned that the payment for his capture was to have been the contents of the file, and as the agreed upon payment no longer existed, neither did the contract. Though Damyish argued that the file's destruction was Glazgon's goal, Glazgon considered the agreement void. He then summoned Major Eil'gi to take Damyish and Castonis to detention. Glazgon not only allowed Starlord to go free, but offered to personally transport the Quarrels back to Iolium, as he had business in the Carinian Cluster. Holmrig was sufficiently far from the Carinian Cluster that a customs agent, at least, had never head of the Probiti. When Sinjin came to Holmrig, someone in a customs-type position noted he was from the Carinian Cluster and commented that he was a ways from home. I don't know what the Crynbur Pelago means, but I would GUESS that Pelago is meant to be a derivation of archipelago, which is a chain, cluster, or collection of islands. I would take that to perhaps refer to a local system or cluster of planets, with Crynbur being the formal name. But...maybe not. Major Eil'gi led the contingent of soldiers backing General Glazgon in his office as Starlord (Sinjin Quarrel) arrived. 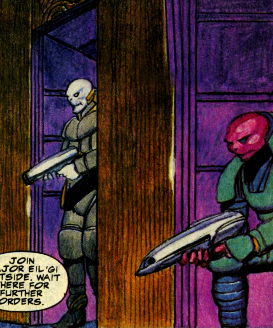 They kept their weapons trained on Starlord until Glazgon instructed them to stand down so Starlord could reveal Harith Damyish's secret (that he was a telepath) in private. 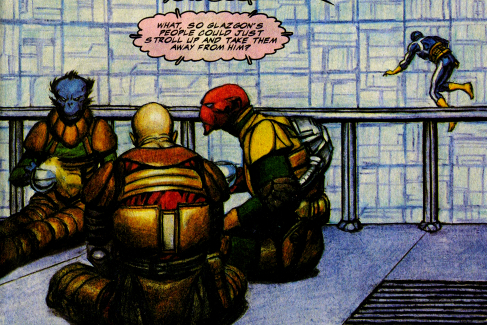 They waited outside, then returned when Glazgon called for Eil'gi to take Damyish and his aid, Colonel Castonis, to detention after Starlord arranged the destruction of Damyish's promised payment (materials he had been using to blackmail Glazgon). They took Damyish and Castonis away. 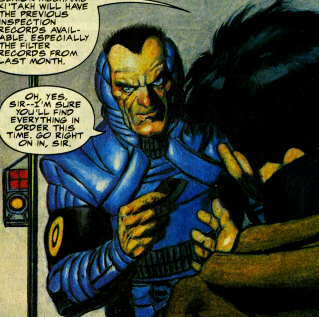 Note: The arrow from the word balloon is a little vague, but I believe Eil'gi is the guy on the right. 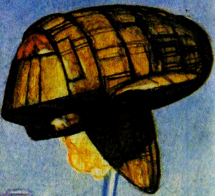 The Iforani were based on the planet Holmrig. The Iforani stored their spacecraft in huge underground hangars. Via the Vehicle Lift Shaft, they transported their ships to the launch bays on the 120th floor. The First Floor was a general admittance area more or less public. 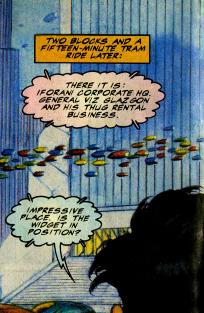 General Viz Glazgon's office was located on the 110th floor. It housed hidden gunports. This location is more or less public, with elevators leading up to the private areas of operation. Nonetheless, you can see the "receptionist" had a healthy supply of weaponry hidden beneath the desk. Viz Glazgon's office was based on the 110th floor in the Iforani headquarters building. 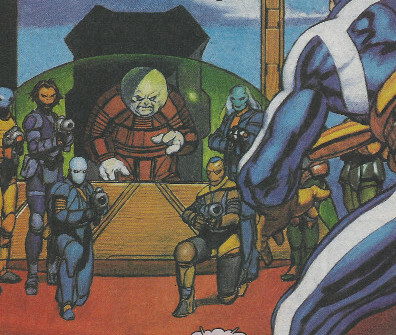 When Starlord arrived in Glazgon's office, Viz Glazgon appeared to be protected within a force field that extended that covered the other soldiers around his desk. His office also held a number (at least two) of hidden gunports, from which an Iforani agent could pick off anyone unsuspected. Unbeknownst to anyone outside the Iforani upper echelon, the walls of Viz Glazgon's office held a number (at least two) of hidden gunports, each of which held an armed Iforani agent who could pick off anyone unsuspected. 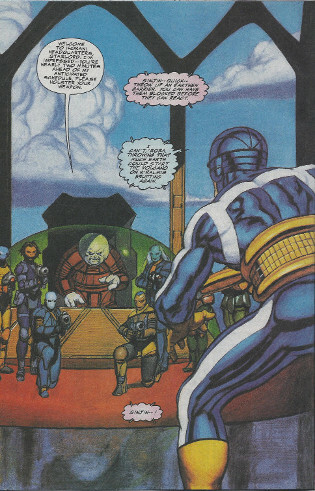 (Starlord#3) - As Starlord (Sinjin Quarrel) prepared to reveal that Damyish was secretly a telepath, Damyish told Glazgon to send out the men in the hidden gunports, and Glazgon complied. Glazgon complimented Damyish on his resources, as he didn't think anyone outside of the Iforani upper echelon knew about his hidden gunports, but Starlord then revealed that Damyish was a telepath. (Starlord#3 (fb) - BTS) - Ki'takh was presumably involved in the building filter inspection 1 month prior to the main story. 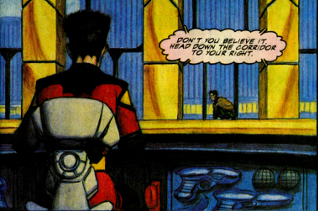 (Starlord#3- BTS) - While infiltrating the Iforani headquarters as "Coppersmith" from the building inspector's office, Sinjin made brief contact with a mechanic in order to telepathically read his mind, and sensed that the man was wondering why they were getting inspected again so soon. Deciding to address the issue before the man asked it, Sinjin said, "I trust senior mechanic Ki'takh will have the inspection records available, especially the filter records from last month." The mechanic assured "Coppersmith" he'd find everything in order this time and gave him the okay to pass. 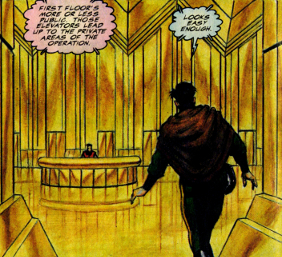 (Starlord#3) - While infiltrating the Iforani headquarters, Sinjin Quarrel -- as directed by Rora -- needed the touch code to utilize the elevators. As he approached the desired portal, he encountered a mechanic, and he introduced himself as as "Coppersmith" from the building inspector's office, asking if he could get to the main heating system through there. The mechanic replied, "Sure, sir. You, uh, have an ID, sir?" Sinjin replied in the affirmative and provided an ID, during the passing of which he made brief contact with the mechanic in order to telepathically read his mind, and sensed that the man was wondering why they were getting inspected again so soon. Deciding to address the issue before the man asked it, Sinjin said, "I trust senior mechanic Ki'takh will have the inspection records available, especially the filter records from last month." The mechanic assured "Coppersmith" he'd find everything in order this time and gave him the okay to "Go right in." The Iforani stored their spacecraft in huge underground hangars. Via the Vehicle Lift Shaft, they transported their ships to the launch bays on the 120th floor. The lift shaft utilized heavy-duty Gravifex beams, which were reportedly safer than having the ships flying up the shaft using their own grav thrusters. When Starlord (Sinjin Quarrel) sneaked into the building, he elected to leap into the middle of the shaft and use it to travel up to the 110th floor rather than try to sneak up 110 flights of stairs undetected. As he approached his destination, he was spotted and fired upon by some of the Iforani. Using air bursts to push himself out of the shaft and onto the walkway, and he then used fire to melt a side panel to exit the room altogether. (Starlord#3) - Glazgon noted how he appreciated Starlord's coming to them and surrendering quietly; but Starlord clarified he was not surrendering, as his partner was about to create some serious trouble for him. At that point Rora began shooting some of the Iforani's Verteor 250 ships out of the air, noting they were good fighters but had glass guts; all she had to do was take out one stabilizer on each ship, and they would get to practice their emergency landings. However, as the next batch came up from below, Rora was forced to station herself above them to block their passage and "stare them down," leaving her unable to help Starlord.